Because you can’t really say you’ve "made it" until there’s an online story that compares your appearance to food. Do you ever see human faces in inanimate objects? Just know that you’re (probably) not crazy, and you’re definitely not alone. People have seen the mugs of iconic figures including Jesus, Obama, and the Virgin Mary in their morning toast—but we’re not just talking bread here. Others have spotted Sylvester Stalone in their peppers, Donald Trump in their vegan butter, and Iggy Azalea in just about every ingredient known to man. Given the abundance of celebrity-food look-alikes, you’d think our food was trying to tell us something. Just remember to stare for a few seconds at that Cheeto or salmon steak before ingesting—if you do, you might just witness the second coming of Christ. Here are 11 foods that bear a striking resemblance to celebrities. This, friend, is what a $8,100 chicken Mcnugget looks like. According to Yahoo, Rebekah Speight of Sioux City, Iowa found this McNugget in her McDonald’s order, saved it for three years, and then sold it on ebay for $8k. While we don’t know who purchased the insanely expensive G.W. look-alike nugget, our best guess is the Smithsonian. In true Iowa fashion, the profits made from the sale went to a youth camp run by Speight’s church. Someone stole this cinnamon bun, which bears a striking likeness to Mother Teresa, from Nashville coffee house Bongo Java on Christmas morning. The Nun Bun, as it’s referred to, caught the world’s attention in 1996 after a customer almost took a bite out of it before spotting the religious sister’s face in the pastry’s flaky folds. According to USA Today, the bun was featured on The Late Show with David Letterman and was mentioned on episodes of The Nanny and Mad About You. This pepper doesn’t look like it got punched as many times as Rocky Balboa did, but man does this veggie do a mean Stalone impression. Just remember to knock those teeth out before cutting it up for your salad. Adrriiiiiiaaaaaannn. People see Jesus everywhere. First it was toast, then it was pizza, and then Time wrote an article about how typical it is to see Christ in your food. Researchers at University of Toronto found that “people who see Jesus or the Virgin Mary in food or other objects may see them because religious beliefs can dramatically impact how they want to see the way life works.” But out of all the Jesus foods out there, Cheesus really is the pièce de résistance. The Jesus-shaped Cheetoh has been taken on the road, and by gosh, everyone’s catching the holy ghost. Naturally, the owner of Cheesus keeps her prized possession in a jewelry box. Star Wars fans are die hards, so it’s no wonder that someone saw the film’s famous Wookie in a walnut. All walnuts look like Wookie fur, but there’s something about that nose that screams Chewy. Onions have layers, just like Whoopi. The Sister Act star and co-host of The View acts, tells jokes, sings, and dances—plus she can make you cry, just like an onion. This one needs no comparison shot; it’s The King, right down to the popped collar. We bet Elvis would have like to put the smoky strip in one of his famous peanut butter, bacon, and banana sandwiches, but that’d be sort of like cannibalism. This one is just uncanny. You can almost feel the contempt that tub of butter has for immigrants and welfare recipients. And we don’t doubt that the container of butter would make a better presidential candidate than Trump himself. 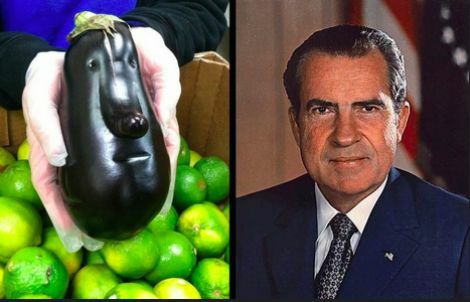 If he was still alive, we have no doubt that President Nixon would be sending eggplant emojis in all his texts to Pat. When Wesley Hosie found this jelly bean staring up at him from his jar, he was sure it was then bride-to-be and now Princess, Kate Middleton. The face is clearly visible and Hosie thought for sure he could cash in on it. The bean was reportedly put up on Ebay with a starting bid of 500 Euros (around $800) but it’s actual sale was never reported on or mentioned…we’re guessing potential buyers thought the face looked a little too much like every brunette ever and decided against it, better luck cashing in next time, Wesley.